The failure of a 15-foot diameter reactor tank supported by four legs was analyzed using advanced engineering assessment methodology. At the time of the incident, the cause of the disruption was unknown. However, the failure was believed to be caused by buckling of the support legs. Shortly after the reported failure, another tank of identical design was immediately taken out of service so that an investigation could be performed. To determine the cause of the failure, an analysis was executed to determine the buckling capacity of the as-built tank design. Buckling is a complex phenomenon and requires the application of advanced finite element analysis (FEA) techniques. Several complexities were involved in simulating the event of buckling collapse, including precise modeling of geometric imperfections based on specific fabrication tolerances, elastic-plastic material behavior simulation, and the use of non-linear and explicit finite element solving techniques. An independent design review found that the tanks had been constructed without a compression ring at the bottom cone floor-to-shell knuckle weld, which is a violation of API 6201. The results of the buckling analysis indicated that the failure was likely due to excessive compressive stress at the floor-to-shell knuckle weld. This article will outline the engineering and assessment methodologies applied during the analysis of this tank failure. The number one concern for operators in the oil and gas industry is avoiding equipment failures. This is true from both a safety standpoint, as well as an economic standpoint. Common causes of failure include, but are not limited to, improper operation, inadequate design, and unexpected loading conditions. No matter the consequence, if a failure occurs, it is vital for the operator to understand the cause so that lessons can be learned and future failures can be prevented. 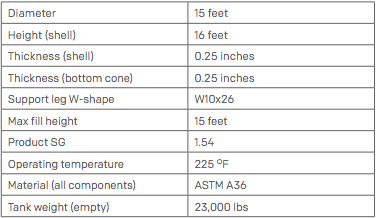 Basic information for this tank is summarized in Table 1. Is this reactor design to API 620 or ASME section... Log in or register to read the rest of this comment.